I just came back from a fall crafts fair, and I was so disappointed to see that all of the baby and toddler sweaters that were for sale by either knitters or crocheters were all in the same baby pink, peach, seafoam green, or blue that has been around for decades. The baby yarn palette needs an update, or perhaps craft fair knitters need to update their garments. Well, as I said yesterday, I’m a bit of a rebel, so I’ve knit a toddler’s sweater with just over one ball of chunky yarn in a fall colorway of Classic Shades Frenzy called “Into the Woods”. Gotta love the name! And now there’s a sleeve! Yes, convert yesterday’s cowl pattern into a toddler sweater. Wait a minute! Isn’t that the cowl from yesterday’s post? Why yes, it is, but today, it’s a toddler’s sweater! My sons are now 20 and 19, and, back when they were little, we didn’t dress them in those baby pastels I saw at the craft fair several days ago. And, I didn’t knit baby clothes in those colors. So it’s not a great departure for me to suggest that kids should wear knits in the whole color spectrum, primary colors, jewel tones, muted adult colors / earth tones, and neutrals, too. If you look at the above picture, you can see a lovely sage green, a pale cornflower blue, some vanilla cream, peach, white, and silver. Lovely pastels that are set in the deeper and brighter rusts and browns of this yarn, giving it much more depth, and making it easy to coordinate with other clothes. I’m remembering back to some terra cotta corduroys we used to put on our boys. Looking at the Universal Yarn’s own webpage, you can find the other 9 colorways that also have a lot of interest. With just a little yarn from the second ball, I converted a cowl design into this sweater. 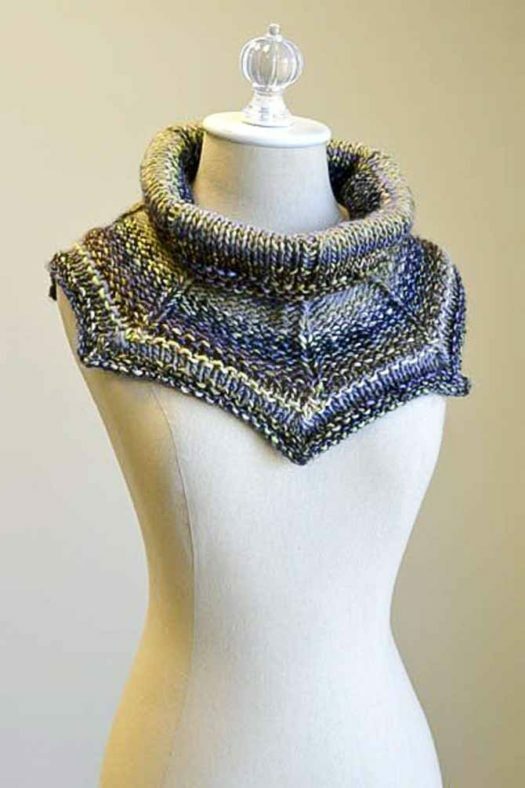 Yesterday, I gave you the pattern to knit an easy and quick cowl with a mock cable. When I finished that cowl, I had just a little bit of yarn left, but it wasn’t enough to convert that cowl into this little sweater you see here: I had to crack open a second skein do the sleeves. Still, it was a fun way to design two different projects in one. To make this sweater which has a 22″ chest, go to yesterday’s post and follow the instructions for the cowl, but don’t seam the two pieces together yet. 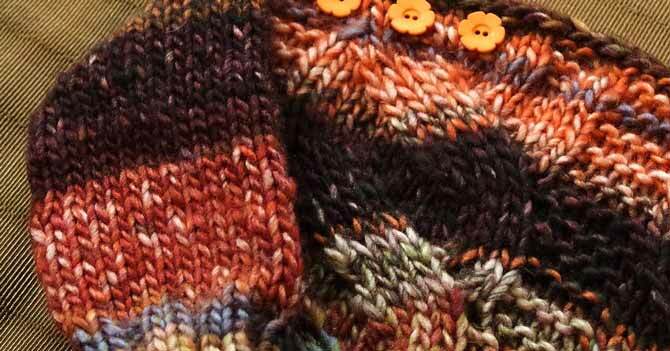 When you work the 2nd panel, be sure to work some button holes with a yarn-over, knit 2 together sequence. I made 3 on the left side of the Front panel. On the left side, sew across the shoulder seam for about 2″ [5cm], but don’t sew the right shoulder. For each sleeve, measure down 3½” [9cm]. Pick up 16 stitches up to the shoulder, then another 16 stitches down the same depth of the other body part. (32 stitches for sleeve). 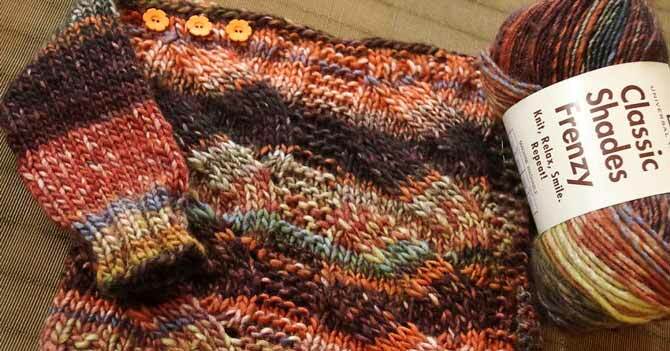 On the un-seamed side, knit across the gap, which will join the front and back to each other. 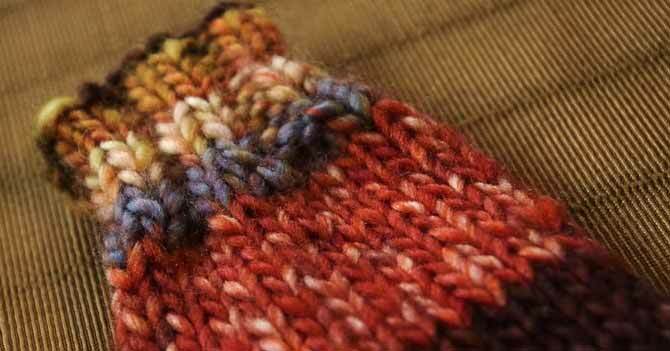 I joined my 32 stitches and knit the sleeves in the round, but you could knit them flat, then seam them. I worked 4 rows in plain stockinette stitch and then decreased 1 stitch on each side of the sleeve every 5th row 4 times to end up with 24 sts. 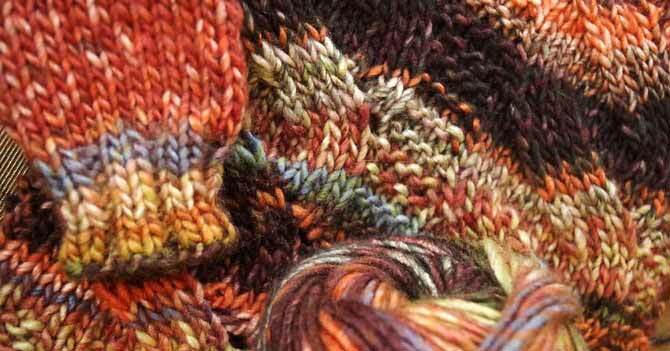 Then, I changed to size 7 US [4.5mm] needles and worked 6 rounds of 2 x 2 ribbing. These were the only buttons I had lying around that coordinated with the colorway, but with so many colors in the yarn, I think it would be easy to find buttons that would work even better than these. I didn’t sew them on because my wife has claimed them for something she’s making. I’m going to have to figure something else out. One other thing. I did promise that we would look at the left leaning decrease in this mock cable pattern. I call it a knit 2 together with a twist. I didn’t invent it, but I came across it online and promptly forgot to record the source, and whether or not that knitter was using the information she’d found elsewhere. This left-leaning decrease takes out that funny extra loop that forms in the decrease when you SSK (slip, slip, knit 2 tog through the back) or when you slip 1, knit 1, and pass the slipped stitch over, so it really is a nice partner to the right-leaning k2tog. To work the knit 2 together with a twist, simply insert the right-hand needle in the front leg of the first stitch like you would normally, and then also insert it into the BACK leg of the 2nd stitch, wrap the yarn around the needle to knit and carefully wiggle the RH needle back and forth up with the stitch. When slide the stitches off the LH needle, it helps to slide the first one and give a little tug on the 2nd one to loosen the stitch toward the back of the work and then continue to slide it off the needle on the RH needle. That’s it. You’ve done a really cool left-leaning decrease that’s great for paired decreases, and fabulous for the mock cable pattern in either this toddler’s sweater or the cowl version. Left-leaning decrease is worked on both right-side row with a knit 2 together twist and wrong-side row with a purl 2 together through the back loops. 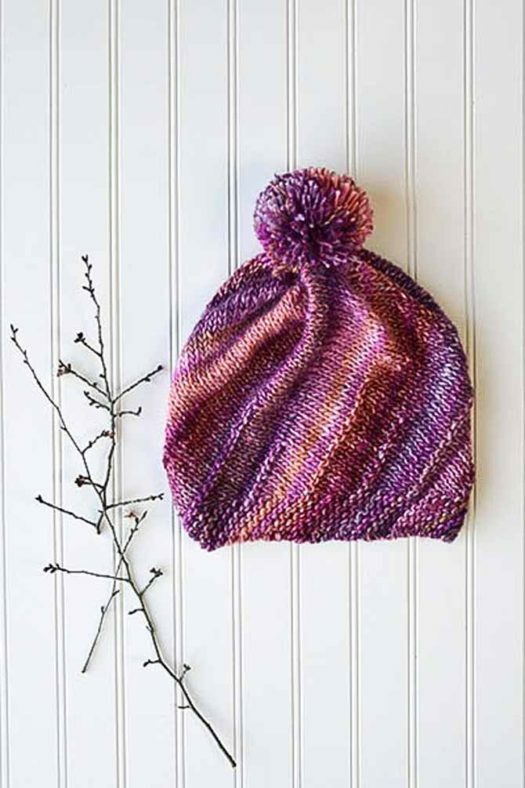 There are a few other 1 or 2 ball projects you can knit with Classic Shades Frenzy, and there are some free patterns available on the Universal Yarn website. 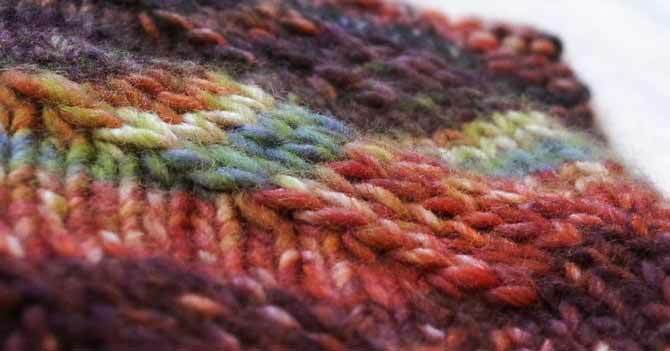 Use 1 skein of Frenzy in “Thrill Ride” colorway to make this free pattern. Dreaming of Spring hat pattern. Tomorrow we move on to another Classic Shades family yarn, and it’s shiny! Aww. Thanks. It was so fast to knit up…let me know if you try it.